1. Whether it is too hot, too cold, or too humid, classroom temperature can affect student comfort. When a student (or teacher) is uncomfortable, focus for that individual shifts from attention to lesson material to finding a way to reduce discomfort. Teachers need to be aware that different areas of the same classroom can have differing temperatures. 2. Classroom lighting is another important factor that can cause a student to wander off task. Both dim light and glare make reading difficult. A wise teacher pays attention to the amount and source of classroom lighting, including glare given off whiteboards or posters. Again, different areas of the same classroom can have differing light. Teachers need to check the quality of light from all areas of the classroom. 3. Visual stimulation works both ways–it can motivate learning or it can disrupt it. Visually stimulating items in a classroom grab student attention. This is helpful when items are used for instructional purposes, but not so helpful, otherwise. Removing an assortment of visually stimulating posters, charts, and doodads from classroom walls, shelves, or desktops, helps minimizes student distraction. 4. Finding a place for student bags and coats that is off to the side, helps minimize distraction. It keeps students from pawing through belongings at inappropriate times. What is not outwardly visible has less power to grab a student’s attention away from the lesson at hand. 5. Row seating may offer an advantage over cluster seating. There are fewer opportunities to talk face-to-face with other students. Rows also allow teacher access to every student. A teacher can move in close and make eye-contact with a single student who needs behavior modification and not need to address or distract a group of students. 6. Minimizing classroom distractions applies to teacher’s clothing choices, as well. Tight-fitting garments, deep-necklines, or busy patterns can distract students. Dangle bracelets and hard-heeled shoes create auditory distractions. The smell of a teacher’s cologne, perfume, or hand fragrance may also prove distracting to a student. 7. Students create classroom noise from coughing, sniffing of runny noses, scooting chairs up to desks, and so on. Having background music or fan noise may help cover some of these sounds, as well as cover sounds coming from nearby classrooms or the hallway. Tennis balls on the bottom of chair legs may help reduce the racket of chairs on hard floor surfaces. 8. Personal wireless devices in a classroom are disruptive. 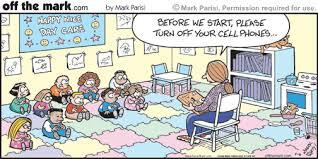 It is best to have students turn off devices during class time or to have devices inaccessible. This minimizes both visual and auditory disruption from wireless devices and curbs cheating. 9. High-traffic areas create a steady stream of distractions. These areas are doorways, around the teacher’s desk, at the pencil sharpener, and at the garbage can. Seating easily distracted students away from high-traffic areas or between students who are less distractible, should lessen distractibility. In some cases, seating a distractible student near the teacher’s desk allows teacher to handle behavior modification without interrupting other students. 10. Facing student desks away from exterior windows, hall doorways, and the teacher’s desk, may be effective in reducing student distraction. Placing garbage cans and pencil sharpeners in areas that already receive high traffic, allows other areas of the classroom to be places of less disruption. Click on the link to read Who Said Grammar Isn’t Important?